David Rickert - Page 3 of 17 - Original cartoon illustrations and Teaching Resources! 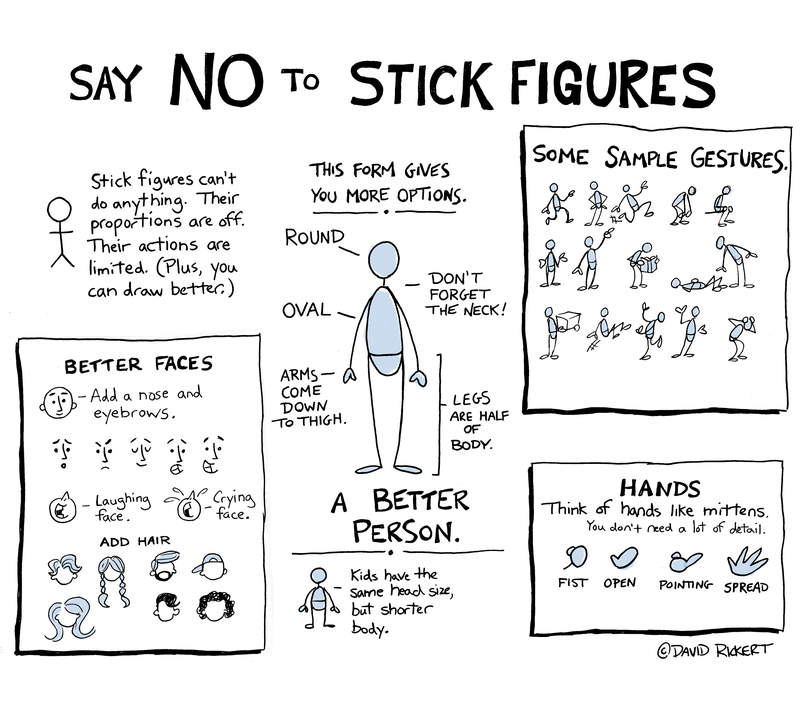 Say NO to Stick Figures! I love having my students draw in class. But I HATE stick figures. Stick figures aren’t really designed to do anything other than stand there. If you want to make them walk or run, or do much of anything, they aren’t designed for it. Furthermore, they aren’t easy to customize. You can add hair. That’s about it. This becomes a problem for my students when I have them doing something creative in class, like sketch notes or a sociogram. They have to find a way to not only represent different characters, but also different things they might be doing such as fighting, arguing, going from place to place. My students will inevitably ask, “Can we use stick figures?” The cynical side of me says they’re just being lazy. But I also think they lack confidence in their drawing abilities. When they were in elementary school, they all believed they were artists. As they get older, the doubts start to creep in. So does the evaluation. They want to take the safe path instead of trying to stretch themselves with their drawing abilities. However, if I’m having my students do creative work I also want them to practice craftsmanship. I want them to work hard at getting better at all aspects of the design process, from layout to neatness to ingenuity. This includes drawing better people. I created the above visual that shows a better way to create stick figures for student projects. These people are easy enough for students to draw and are suitable for a variety of poses. I also provided some instruction on how to create better faces (noses and eyebrows are the key) as well as how to draw hair (the easiest way to customize characters.) I’ve also included four hand shapes that students might use because hands are always tricky. Here’s the image as a jpeg file. If you would like to project this in the front of your classroom or add it to your class webpage, here’s the same image as a PowerPoint slide. Many students find annotation a chore. They do it for the teacher and not for their own benefit. They claim annotating makes them hate reading. I understand where they’re coming from. Annotation is difficult. It slows down the reading process. However, we can’t build active readers without it. We want students to interact with the text and make it their own. Annotation does that. However, we what can do is reward them for their work. Here are some fun games where students use their annotations to earn points. This challenge involves the Padlet app. I’m not going to get into the basics of Padlet — you can go to their website and get a good explanation of how it works (it’s easy.) But if you’re already 1:1 it’s easy to implement. Students can also use the app on their phones as well. If you don’t have devices in the classroom — or if you lust want to go low tech for the day —you can do it on large sheets of paper with post-its. I like to do the Padlet challenge when we are about halfway through the novel. Before class select a list of items that students might have annotated as they read. Or you might have asked them to do certain types of annotations, such as asking questions or making predictions. Either will work. Assign point values to each item. For instance you might assign 1 point to things that are relatively easy to find or more common, and 2 points to things that aren’t as frequent or take a lot more effort to spot. During class divide the class into groups of four or five. One member of the group will create a CANVAS with the Padlet app and share it with the others members of the group AND the teacher. The students title the canvas with the names of the members of your group. Students accumulate points by adding a PHOTO OF AN ANNOTATED PAGE to the shared canvas. In order to count for points, annotations must meet the following criteria: they must have a part of the passage highlighted or underlined, and they must have a comment that explains why it is significant. Total the points. The group with the most points wins. The Padlet Challenge has worked well for me because it rewards those who annotated well in the first place, while allowing those who didn’t to participate as well because they can still create annotations as they play. A fellow teacher and I developed this years ago and had a lot of fun with it — especially when we dealt the superintendent in when he came to our classroom for a visit. This one requires a little more setup, and a basic knowledge of euchre and euchre tournaments work is helpful, but not required. Basically in a euchre tournament you don’t play with a partner. You play by yourself, rotating through a number of different players. You keep the points that you win with your current partner and advance to the next game. Each student needs to have a copy of the book. For each round, you are partners with the person across from you, just like in regular euchre. Choose a page (or a chapter — it depends on the length of your book). You’ll want to choose a passage that is especially rich in content and details. This will be your “hand” for all four games in each round. For each “game” you will be asked to annotate your passage for a specific topic. For instance, you may be asked to find examples of character development or a specific symbol. You will then mark any examples of this in your passage. For each example in your passage you will get a point along with any points your partner accumulates. At the end of each round, the winners will move to the next table and the losers will remain. One loser will move to occupy the chair next to their partner from the previous round so that no one plays with the same person twice. If there is a table of two, those players will play together. If there is a table of three, each player will play individually, the players with the highest scores will move on. The player who accumulates the most points at the end of the game wins. The trick is to keep this moving quickly or you’ll run out of time. One minute per hand is optimal. Students need to be on the honors system for this one because they could make up their points or change “hands.” But as long as you aren’t assigning a grade for it, the students don’t have much incentive to cheat. I always like to tell them that in high school we are all winners. Sample Bingo card with page numbers. You can do chapters as well. This requires you to use a custom bingo card generator in which you can choose your own columns and numbers. They are easy to find if you search for custom bingo cards or you can find one here. 1. You’ll create these cards by replacing BINGO with things you had them look for as they read. Or if you are using a bingo card generator that won’t allow you to change the BINGO, just assign something to each letter. Because you can customize the spaces as well, you can add page numbers or chapters or whatever you’d like. You can do this game at any point in the novel, but it works best when you’ve read at least a third. I suggest using chapters or a small range of pages instead of individual pages because it will make the game go faster. You may want to use a 4X4 grid because it will make each game go faster as well. 3. Again, you’ll want to keep the game moving or it can drag. Give students enough to locate each item, but that’s it. 4. In order to prove that they have BINGO, they have to show their annotations on the page. My students struggle with topic sentences. It’s something we always want to get better at because nothing improves their writing faster than crafting topic sentences that guide the reader through their writing. Students typically have one of the following problems with their topic sentences when writing about literature. They don’t have one at all. They discuss a topic but don’t have a topic sentence that tells the reader what point they are making. They start a paragraph with a fact, not a claim. When they do this, they tell what happens in the story, but haven’t given themselves something they have to support with details. They stray from their topic sentence. While this could be an organization problem in which students don’t stick with the topic of their choice, it could also be that the topic sentence doesn’t adequately reflect what the paragraph is about. When I notice that my students are having problems with their topic sentences, I know it’s time to practice writing them. Here’s how I do it. Seeing the woman as she was made them remember the envy they had stored up from other times. So they chewed up the back parts of their minds and swallowed with relish. They made burning statements with questions, and killing tools out of laughs. It was mass cruelty. A mood come alive. Words walking without masters; walking altogether like harmony in a song. Because this passage is mostly metaphors, we start there. They divide sheet a paper in half. On the left side they list the metaphors, such as “they passed nations through their mouths.” On the right side they tell what the metaphors mean – both the literal meaning (they talk about a lot) and why it is significant (their gossip is an important part of their day.) If the passage I chose doesn’t have a lot of difficult language, I have them list the important details. Now that we have closely examined the passage, we can move on to creating a topic sentence. Our goal is to create a topic sentence that requires us to support it with evidence. And we want our topic sentence to account for as many details in the paragraphs as we can. This is a hard step for most students, but it’s where the good work occurs in building good topic sentences. For example, we might list these details from the passage: They sat in judgment; the envy they had stored up from other times; burning statements with questions; killing tools out of laughs; mass cruelty. Then we can make the claim that the talk on the porch is critical of others, or judgmental towards the woman who appears at the beginning of the second paragraph. We might also make the interpretive leap that since they have spent all day working submissively for other people, that their gossip makes them feel powerful. There are several ways to create an effective topic sentence. At this point, we want to see students creating topics sentences that make the rest of the paragraph easy to write because all of the details fall into place. A common problem at this step is that students will pick a topic sentence that can only be supported by one or two details. In this case, they need to revise their topic sentence to be broader. Choose a passage in which a character is described. Ask students what is revealed about that character. Choose a passage that describes the setting. Ask students what is revealed about the setting that’s important. What does the author want us to know about where the story occurs beyond just the time and place? Choose a dream sequence. What about the dream is important? Choose a passage in which a character is engaged in self-reflection. What does he or she discover? A good way to frame the importance of topic sentences to students is to tell them that anyone who reads ONLY their topic sentences in a piece of writing should be able to trace their line of thinking. And at the beginning of the year when we are really working on topic sentences I might only evaluate their ability to construct them and downplay everything else. We want writing that is clear, concise, and organized. Students might have good points, but they can get lost in the writing if topic sentences aren’t there to guide them. I begin class by with a short story. An extremely short story, in fact —it’s called “The Birthday Party” and it’s only three paragraphs long. Reading it with a class is an opportunity to see what my students do when they are asked to do a close read. We’ve trained them well in English classes over the past few years — they grab a pencil or pen because they are ready to annotate. Close reading is a valuable skill, but how can we teach it so it becomes meaningful work? What are the strategies we can give all readers so that they will be successful not just at reading passages on tests, but also while thinking critically about what they read as adults? I read about a strategy that Brian Sztabnik uses. He asks his students to answer three questions. The following strategy is based on that. Here’s his blog post. How were you made to notice it? Why are you noticing it? The first step is What do you notice? When reading a selection I ask students: what do you know to be true? If we don’t know what happens in a passage, we can’t analyze the rest. Then we move on to things that they saw that they had to figure out (in other words, inferences they’ve made.) They know these things to be true as well, but they had to read between the lines. Step 2: How were you made to notice it? The second step is How were you made to notice it? This is when we examine the nuts and bolts or the author’s writing. What literary devices does the author use to call your attention to what’s important? If I have an especially adept group, we might look at how syntax and diction call our attention to certain things. Step 3: Why are you noticing it? The final step is Why are you noticing it? Why did the author create this piece? What was their goal? What about human nature did they want to illuminate for us, perhaps? I like to start with a picture to get the ball rolling. 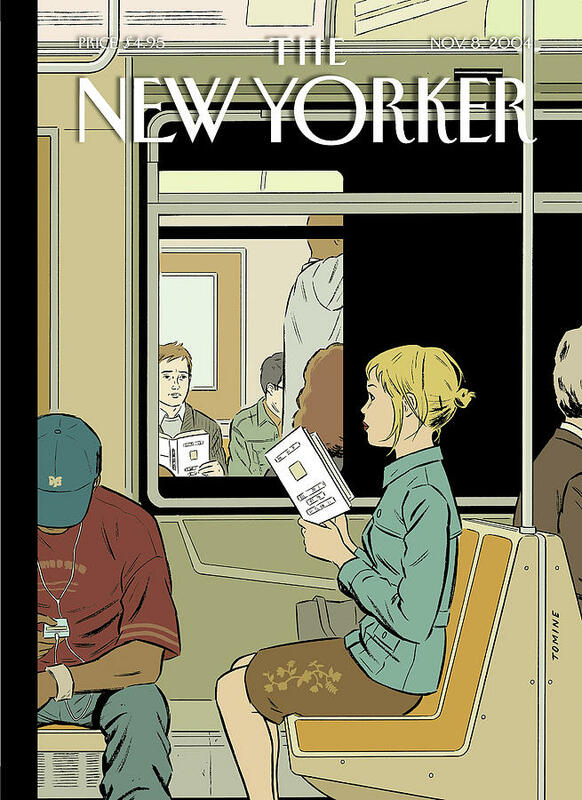 Adrian Tomine has some wonderful New Yorker covers that are perfect for this task. Here’s the one I use, but there are plenty of others. I project this image on the screen and give them a photocopy of the image to annotate. At first I don’t give them any direction other than to annotate the image, writing down everything they notice. I want to see what they do when I don’t give them specific guidelines, open to the possibilities of whatever the picture reveals to them. After five minutes of annotating we proceed to step one: I ask them to tell me what they know to be true. We cover the basics of the image: there’s a man and a woman reading the same book. They are looking at each other. They are riding a subway. There’s a guy listening to music. It doesn’t take long to get all the basics. We then move on to step two: I ask them how they were made to notice it. I begin by asking them what the focus of the image is. They all know it’s the man and the woman reading the same book. I ask them how they were made to see that. Eventually some details of the craftsmanship of the image emerges. The books are both white (and they are the only white objects in the picture). The faces of the man and the women are the only faces visible. They are framed by the windows of the subway cars. After we’ve looked at the image I hand out Katherine Brush’s short story “The Birthday Party” which you can find online (but any one page short story will do.) We repeat the process. The students annotate the story, just seeing what they notice. I then ask the same question — What do you know to be true? Brush’s straightforward prose makes the details easy to pick out. Then we move on to what they have to figure out, such as: what kind of restaurant is it? What else do you have to figure out because of the point of view? We don’t really know why the man is upset about the birthday cake, or any of their backstory for that matter. We just have to make guesses based on what the narrator observes. But at this point we are thinking about the how — the elements that Brush includes to tell us what’s going on between them. Finally, I ask them why this story was written. There doesn’t seem to be a moral here, so I lead them to think about what the author might be saying about particular types of people. Many of them get to “some people don’t like to be surprised” and I often throw out that perhaps the story is about how we never really know what goes on behind the scenes in a relationship we observe from afar. At this point I’m ready to turn them loose on a longer short story. My favorite story to start of the year is “The Necklace” by Guy de Maupassant because there are several opportunities to isolate a few paragraphs to look closely at what’s going on. And other good follow up strategy is to give them a piece of non-fiction, such as an editorial from a newspaper. The method is the same: What is the author writing about? How does the author make his case? Why is he writing about it? We want our students to leave our classroom with the skills necessary to be good readers and thinkers. Close reading gives them the strategies they need to reliably perform this skill in a variety of settings.